Another helpful hint for hunting! Rubber boots need to be washed before use! The Scenario: You just bought a new pair of rubber hunting boots and you notice the factory's new fumes permeating the air around them If you're like me, your next thought would go something like this . . . "I thought rubber boots were supposed to prevent my scent from being all over everything but these boots smell like I just walked through a chemical dump site. How is this NOT going to scare a deer away?" I'm sure it's safe to assume that if your rubber boots smell like a chemical factory right out of the box, the deer can probably smell them too. At one point in time, I had a pair of Northerner rubber boots that were odorless. I found them in a pile of junk on the side of the road; what luck. They fit well and they literally smelled like nothing. I never thought anything of having an odorless pair of boots until I finally lost them (They were stolen.) and found myself purchasing a new pair (on sale) at the local Farm & Fleet. Had I been more prepared and on the ball, I would have sniffed the new boots before purchasing them. If I would've done that, I probably wouldn't have purchased the new boots because of its excessive new chemical stench. Afterwards, in a state of turmoil, I decided to go back to the store to see if any of the other rubber boots had the same odor. What I found was that almost every pair of rubber boots or item on the shelf smelled of factory chemicals. Now, I know many o' hunters who went hunting with a new pair of rubber boots on their feet and never once considered whether they smelled or not. General conventional knowledge dictates that "rubber boots are good for hunting" and that's usually the end thought most hunters have. As for the new boots I purchased, they came with a big stinkin' problem. How the hell could I expect the deer not to smell my boots? So, I started my own little experiment called, "How the hell do you get the smell off rubber boots?" I started with my basic odor removal process I use on much of my hunting equipment: distilled white vinegar, regular dish soap and, of course, baking soda. These three key "ingredients" have proven quite effective in the past; however, they were not able to remove the stench from the new rubber boots. My next step was to try something a bit stronger. So, I upgraded to rubbing alcohol, which proved to be a total waste of time and resources. I didn't want to keep dousing my boots with stronger chemicals. I was stumped. Then, I remembered my old Northerner rubber boots and had a brainstorm. Perhaps, if I weather the boots, it would help reduce the factory smell. So, I placed them outside underneath a deck, exposing them to rain, cold, heat, leaves, dirt and nature's other gifts. About a month later, I pulled them out only to find the smell still strong and lingering. Yet, another fail. How was I ever going to remove the chemical odor form my boots? The Solution: Finally, after much turmoil and even more buyer’s remorse, I stood defeated. I could not, for the life of me, figure out how to get the chemical odor out of my rubber boots. So, I took them, soaking wet after a long rain, and hung them out on the clothes line to dry in the sun. I forgot about them for a couple of sunshine filled days before finally bringing them inside (before the dog made a new chew toy out of them). I picked up the boots and could not smell any trace of an odor. It finally happened! I had to sniff test. I checked and sniffed and sniffed and still, no odor! Then, it dawned on me. The only thing I had done was to leave them out in full sunlight for a few days. The sun is well known for its ability to deteriorate plastics and synthetic materials, fade inks, break down and decompose many things. And, yes, it worked on my boots. Placing my boots in the hot summer sun for a few days proved to be the most effective method of removing its factory chemical odor. I tested my new found method on other rubberized/nylon packs I had and it proved to be just as effective as before. Lesson learned! A simple wash will remove some of the factory chemical smell from your rubber boots (or gear) but the sun still needs to do the rest. So, make sure to lay your boots outside in the sun, let the sun heat those babies up for a few days, maybe turn them over, and you should be all set to go. My Theory: Sunlight naturally breaks down materials. Now, it may wear a little on your boots but no more than you walking in them or leaving them outside all day. Not to mention, most of the residual smell is probably not the solid rubber so much as the chemicals and left over residual particles of rubber and other chemicals lingering on your boots after they hopped off the machine in the factory. The sun breaks these residual particles down just like the rubber on your boots. Keep in mind, the rubber on your boots will last an incredibly long time but the residual particles or cause of the odor does not. 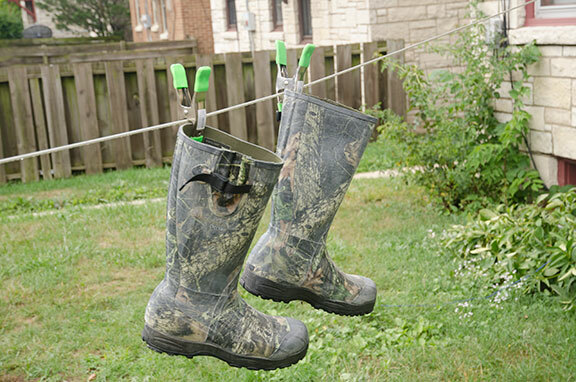 Another Suggestion: Keep the boots outside and away from other odors once they are clean and odor-free. When placing them in your vehicle, I recommend putting them in a deodorized bin or on top of pine tree branches/leaves in the trunk. This should help minimize them coming into contact with other odors not found at your hunting spot. Do not put them before you leave your house and then stop at a gas station on the way to your hunting spot. You might as well just leave a gasoline trail to your spot. Worth Mentioning: Sunlight also kills germs and may even sterilize odor-causing bacteria (just like freezing them in a plastic bag in your freezer will do). In essence, sunlight effectively kills the bacteria, which works great for removing stinky foot odor, assuming that you don't re-introduce the smell again afterwards. However, this may be hard not to do, especially for non-breathable type rubber boots that are used for walking through marshes or farm fields. Excellent idea! I'm going to try it this week (weather permitting) on my new RedHead hunting boots. Just the soles are rubber but I can smell them from 3 feet away which means a deer can probably smell them from 100 yards. I can't wait to try this! I won't be using this idea for hunting boots though.I'll be using this idea for my kids new rain boots that are smelling up the house! I'm also gonna tell my friend who's daughter wears the awful smelling "jellie" shoes! Thanks!